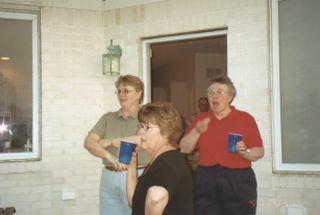 Susan Hutchens, Susan Oliphant and Bud Wiseman's wife, Sue at a recent planning meeting. Married in 1977 to James W. Earls and resided in Greenwood,Indiana. Widowed in 1994. Worked at Cinergy Corporation 31 years,Creative Services Dept.,Graphic Designer,retiring in June 2000. I enjoy traveling,gardening,painting,and cartooning and currently I'm working at my leisure and for my own amusement, a comic strip hero character. I collect original cartoon/comic strip art. My love for traveling and painting is combined with attending watercolor workshops around the country. 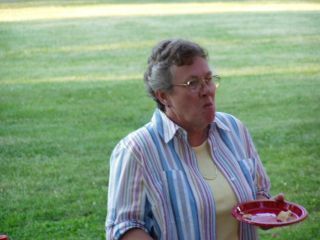 Susan enjoying a snack at Friday's cookout.